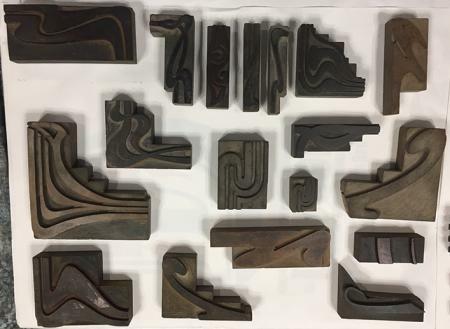 Earlier topic: What are these brass blocks? Nouveau or Art Deco Border Identification? Nouveau or Art Deco? or other? I am interested if there were long connecting side pieces that match this style. All I have are corners? Any specimen pages/dates would be great , too. That’s a great find. Definitely Art Noveau. 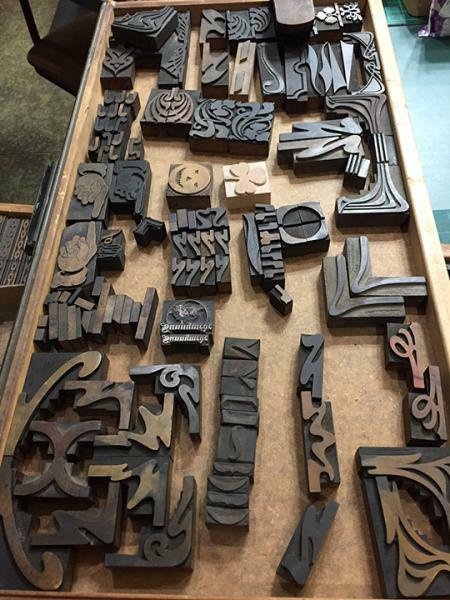 I recognize many of the pieces as being from Hamilton Wood Type company. For straight pieces, you can just use wood rule in between the elements. It looks like you might have a case of rule under the exposed case (if it’s not all decorative). You just match the width of the rule to the mating end of the decorative element and align it by shimming with leads, slugs, or paper strips until it aligns with the terminus of the element. John — see attached image, this was the only piece that came with the corner pieces. It fits very nicely between the two — was this piece part of a complete set maybe? And, are you saying I could build similar but with three individual wood rule aligned side by side to mimic what we see in that solid side piece? I have a bunch of these Art Nouveu border pieces as well. There’s also a closely related Mineola border which it looks like you also have some pieces of. Fun stuff. Yes, that one has a special rule design, and could be made up of wood or metal rule of the proper face width, stacked to make up the design. I was mostly writing about the majority of the pieces which utilize single-face rule segments to complete the borders. 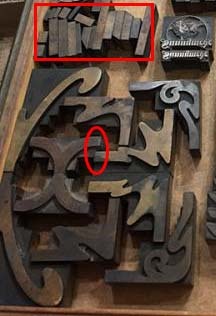 If you obtained these corners, there was, no doubt, in the same shop the straight rule segments to fit the corners and center elements you have. I marked out a few in the case photo you provided with a square, and the ends they fit with an ellipse. Look through your cases to find more of these wood rule segments, hopefully some longer than these. In lieu of these, you could make plates (photopolymer or metal) to fit these in your layout. Mike — Thank you. Fantastic Hamilton page references — do you have any missing characters from pairs? Is that Hamilton Specimen Catalog online somewhere that you know of? John — Thanks for that info, I picked up all that was there but I will check … mgurzo posted links to some specimen pages that are very helpful for understanding the border structure (above).